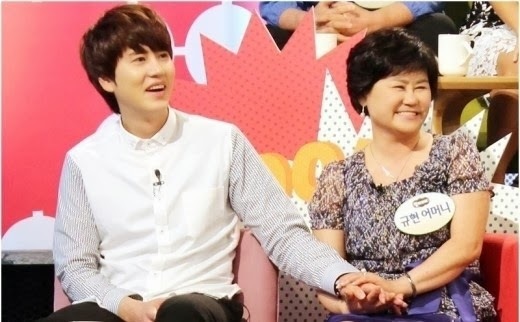 Super Junior's Kyuhyun and his mother have appeared on KBS' 'Mamma Mia' together. Mothers in Korea usually object strongly when they hear that their children want to be a singer. Parents want their children to be obedient and follow their wishes as diligent students. However, no parent ever persuaded a determined child to do otherwise. Once mothers are determined to let their children be K-Pop stars, the situation may completely change. At this step, the mothers are getting overly involved in the K-Pop industry. According to circumstances, a preparatory stage for K-Pop star could cost much money unexpectedly. As a trainee of a entertainment agency, you may have to be waiting for years to make a debut. The trainee period can differ depending on each individual's singing or dancing ability and appearance. What if your child isn't pretty/handsome enough to be a K-Pop star? There is a way. It's plastic surgery. However, poor children can't even dream of having a plastic surgery. There is a gap between rich and poor in the trainees' world too. Some of the trainees can go ahead by taking advantage of rich parents. Let's take a look at an actual case. There is a 5-member girl group who took great advantage of one of the members' parents. Well, the member's father is a plastic surgeon and all the members could have plastic surgery for free. Think about it. It may cost more than 50,000 dollars to make the 5 members look totally different through the surgery. Without the father's help, maybe the group wasn't able to make a debut at a proper time. Sometimes. there are parents who are involved in music service companies. In K-Pop industry, it is an enormous power! The trainee can grab an opportunity to debut earlier than others, and if he/she has already debuted as a singer, the singer's song can be promoted extensively at variety of music service websites. Most of the K-Pop idols trust parents with their money because they're still young. K-Pop stars visit the agency and calculate incomes regularly with their parents. Well, from the official of a K-Pop agency, I've heard an interesting story about the parents. When he first met with one mother of K-Pop idol, she was a countrified woman who dressed unsophisticatedly. However, as the income of the idol has increased, the mother gradually became a well-dressed person who likes brand-name products. Once the parents come to love money, things become more complex. Have you seen the news that a K-Pop idol group is in a breakup crisis due to the members' discord? Actually, in some cases, it is the parents' discord, not the members'. Parents of Kpop group's members occasionally have an argument over the group's contracted period and the direction of activity. This meaningless fight causes the group to disband regardless the idol members' opinions. Even now, there are not a few K-Pop idol groups who are suffering from this kind of problems.